As I suspected, it has gotten very cold, once again. Honestly, I am completely okay with this. I do not think my winter clothing have been able to be used to their full potential in such a short amount of time. Plus, there is nothing better than putting on your favorite ugly sweater. PS- My current camera is completely falling apart. I will be getting a new digital one soon, 400$ or less. Any suggestions? Wearing: Jenny Yuen 'Gia' bag; secondhand Dress; thrifted vintage sweater; Payless fioni booties; Walmart tights. I just love your shoes, girl :) nice pics! This is not an ugly sweater! If that was the case, my closet would be full of them, haha. You look so cute as usual. I don't think I can ever question what you wear. you're so cute in that sweater. i love it. btw, pls let me know if you're interested in exchanging links. damnit lady. i want your bag! My "ugly" sweater has actually come into style recently. However, your sweater is not ugly, especially because it looks totally warm! oh dear, no, that's not an ugly sweater. i have the obe which uglier than that! LOL. anyway, you had mix-match that become so great! please do come visit my blog, it would be nice to meet you there. It's not ugly at all, I love the oversized shape of it. And the pictures that your boyfriend took below are gooorgeous. It's amazing. I want one but that's too much for me. oh but that sweater look so cute with the way you styled it! thank you for the sweet comment about my distressed denim. your vintage is great.i like the details! ugly sweaters are pretty much my favorite thing ever, whenever i'm in a thrift store i find myself oddly drawn to the oversized sweaters that look like they belonged to eighty-year-old men. Me encantó el bolso. Gracias por tu comentario, besos, Gala. I love the sweater--it's so wonderfully tweed-y. And I've been looking for a white dress just like that. Ugly cardies are the best! I have millions. haha. You look super hot. Thanks for the sweet comment. i love your dress!! !so amazing!! !and, i have to say it, you have some gorgeus legs! !and the sweater is really nice. You have the greatest clothes!! That cardigan isn't ugly and all, it's fantastic! If you find a good camera let me know, I desperately want a digital SLR... I can dream. Your ugly sweater is so pretty! Love the look! oh not ugly at all silly one! looks fab!!! great shots as always miss. 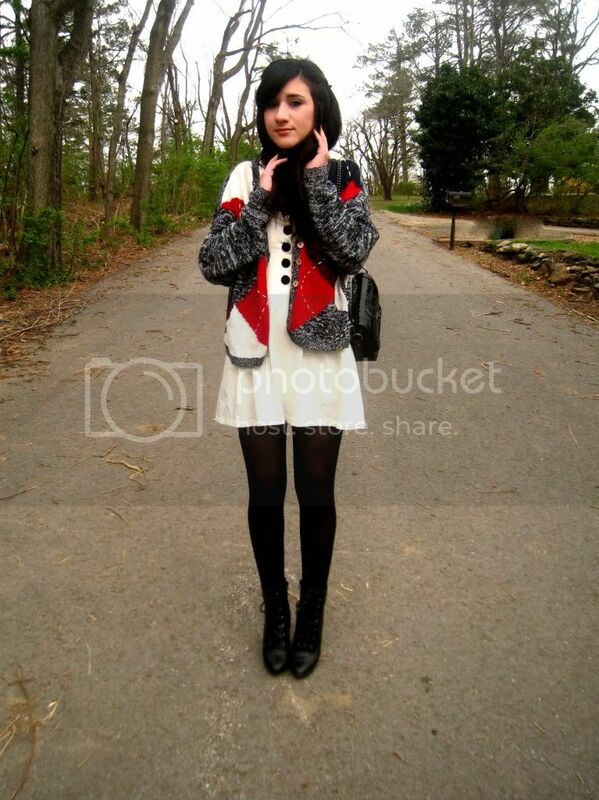 That sweater is totally cute I love the patchwork detailing. And also because I think your blog is super awesome and I dig you fun feminine style I tagged you for a couple of awards. Check em' out. I wouldn't consider the sweater ugly at all! I think it's quite stylish. Cool outfit! I really really love this outfit, the plain dress with the wonderfull cardigan! I love that sweater it is so cute, especially paired with that dress which, again, I love. I cannot believe I hadn't found your blog until now, I love it - your style is amazing and so inspirational. thank you for your comment, I'm totally in love with your dress! Hi beautiful, you have the most gorge eyes sweetie! 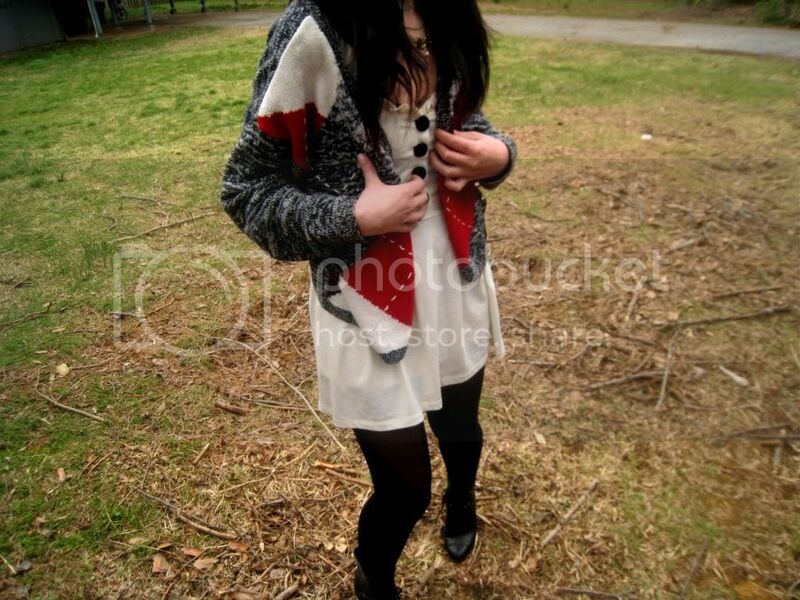 I love that cardigan and the dress. Wish i could give you tips on the camera but i'm a bit rubbish when it comes to cameras honey. good luck in your hunt and try googling and reading camera reviews online or even pop into a camera store for professional advice. haha, so funny title! but i think you sweater is very COOL :) u have so much style..
ah i love oversized ugly sweaters. they are definitely a must-have. omg. dear you are SOOOO cute i love the cardi with the dress. you look amazing. I love the sweater!! It looks so comfy. Definately not an ugly sweater! I like those shoes. agreed! mine is baby pink and has these crazy futuristic pleats at the shoulders. my boyfriend says it looks like something my 80-year-old grandmother would wear. love love love your jacket ! Canon Powershot SX10IS 10MP Digital Camera Almost 100% satisfied. ﻿﻿﻿Esta is almost perfect. I am not going to add much to what other reviewers have said: I agree with all the positive points (battery usage, easy to contain, big lenses that adapt to almost nothing, not too much weight to shoot but at the same time, feels solid, easy-to-use, the rotation of the LCD screen, etc. ).